This week was a week of firsts: I met a Dame – a proper one, with a badge and everything (I presume there was a badge somewhere, I didn’t actually get to see one). I saw a musical comedy about plotting pensioners, where the old women were played by old(ish) men; and I had my first Vegan salad. (It was quite possibly the nicest salad I’ve ever had). After a quick re-think, I realised that it wasn’t really the first time for any of these things. I have actually met a Dame before, I have seen a similar concept of the musical in other forms, (although not as funny), and I’ve definitely eaten a salad, with more or less similar ingredients. I figured that perhaps I’d just forgotten these things or maybe I wasn’t fully present to them at the time. In fact, research shows that people’s minds do wander on average 47% of the time and those who were less focused on what was happening in the present moment, were substantially less happy. So, I decided from now on, I would try to be fully present and treat everything as if it was a “FIRST”. My first proper, no-nonsense, this-is-definitely-a-first FIRST, was a Happynesshub trip to The Museum of Happiness in East London, a place where you can “learn more about the essence of happiness and well-being”. Nestled at the back of The Canvas Café, through an ornamental garden, it was simply four walls bursting with happiness. There were books, exhibits, events on offer, even a gratitude tree for the guests – which we loved. 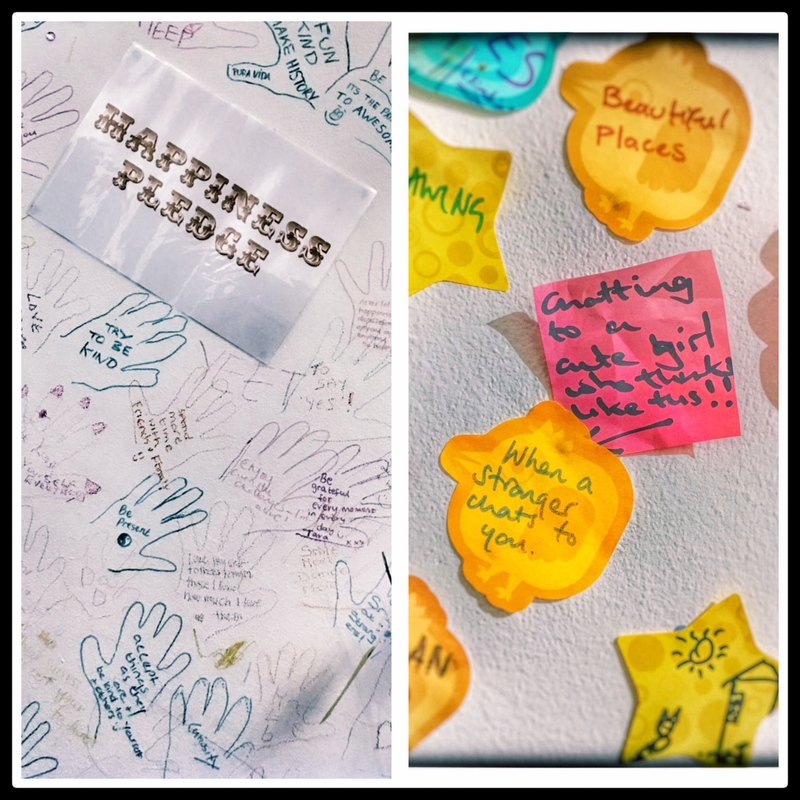 It also seemed that this old happiness lark was an interactive process, with a growing “happy” community of visitors leaving their own pearls of happiness on the walls, either in handprints or as notes for others to find. There was a real sense of sharing and spreading the happiness around. We all own it and we can leave it for others. We were fascinated by the Facts Wall. Did you know that you can smell happy? Apparently, in tests where participants smelt other people’s sweat (surely that’s a job FIRST? ), those who smelt the sweat from someone who felt happy, were more likely to exhibit an authentic smile. So, “happy sweat” may well have a distinctive chemical make-up that our noses can detect! Then came the lunch FIRST at The Canvas Café, London’s FIRST ‘happiness’ eatery, and enter my FIRST(ish) vegan salad and a chocolate and raspberry cake, with a “happy smell” that stayed with me all week. We came away feeling uplifted and re-energised by our visit. Even though this was my FIRST trip to The Museum of Happiness, I knew it wouldn’t be my LAST. What the Museum did so well for us was to create an environment that allows you to experience the happiness, whilst simultaneously making you happy. Happy days. So, a huge thanks to Vicky at The Museum of Happiness and Ruth at The Canvas Café for looking after us. We will be back soon, so please save me some more of that salad, whilst we have a go at planting our own gratitude tree. Planting a tree – there’s another FIRST. Morning fellow “happinesshubers”, just woken up, as usual, in the very early hours, and opened this very inspiring story from Paul. Makes me cheery and feel life is certainly worth living.! I organise regular dinners in a turkish restaurant in london for my ex colleagues. Ladt ome was Wednesday. Well, Rosie had to cancel, because her mother passed away. Rita & Nigel also couldn’t come because Rita’s mother was at. ” death’s door. “!, Ivan (the terrible ) was sick, so had to cancel. Also judith had the sniffles. Douglas didn’t arrive, for some reason, so 6 of us dined in style, toasting,absent friends.!!! We are such a happy crowd, and this is what we want in life. Our friends who had to cancel were so sorry not to be with us, and we felt likewise. Looking forward to next time. Isn’t Sally also, such a wonderful friend.